Sometimes, especially in radar applications, our aim is to control the shape of the pulse in the far zone at the particular direction from the transmitting antenna. The NTF Fixed Angle (NTFFA) post-processing activates near-to-far field transformation in the time domain, directly from the time-domain fields, for a set of fixed directions (defined as pair of Phi and Theta angles) and then performs the Fourier transform of the far-field result. The first stage of the NTFFA post-processing delivers the impulse response in the far field, for a set of fixed directions. 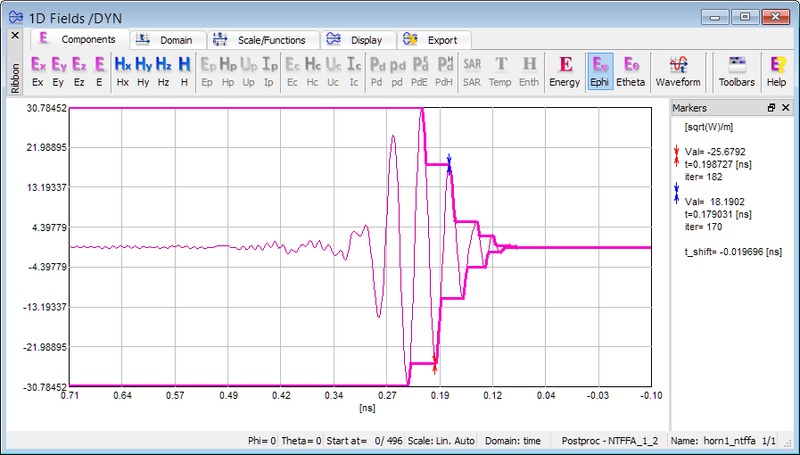 The results, as time domain variations of Etheta and Ephi are available via 1D Fields window. Direction information containing the pair of Phi and Theta angles is displayed in the status bar. See also Radiation at Fixed Angle versus frequency and online documentation about impulse response in the far-field.